We had planned a trash shooting and roving woods clean –up shoot, under the guise of a small game hunt. We wanted to have some fun, practice some shooting, and get a couple bags of trash and litter from the woods. 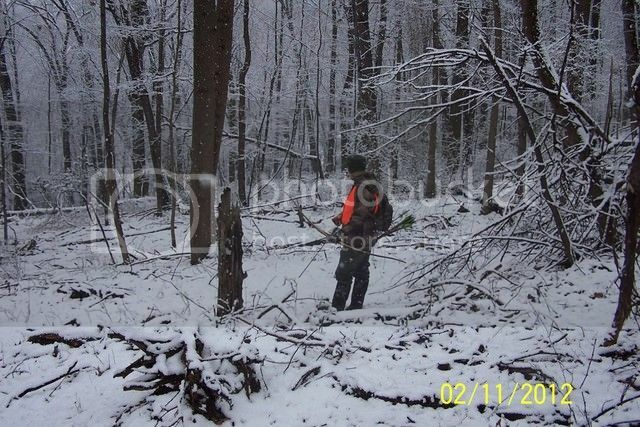 The hero shot with a pickup truck full of trash bags would go a long way to ensuring future hunting rights on the small farm property we had permission to hunt on. Being a good custodian to the land and treating the place with respect makes giant impacts on those that care about their farms, especially to owners that are non-hunters such as these were. Having had use of a family farm growing up I can relate to the pride, concern for the land, and value legacy owners hold for the dwindling number of small properties that are left. Well, mother nature had a different plan for this particular hunt. When Brent and Mike assembled at my house Saturday morning at about 7am, there were several inches of snow cover on the grass and it was still coming down. We quickly realized trash pickup would be impossible under the blanket of snow. The flakes were falling as we donned our gear and strung up our bows at the parking area. Mike had not even gotten to throw on his orange vest when he saw a squirrel on the ground a couple 50 yards away in the woodline. We quickly surrounded the tree and realized we had 2 squirrels surrounded in this particular tree. 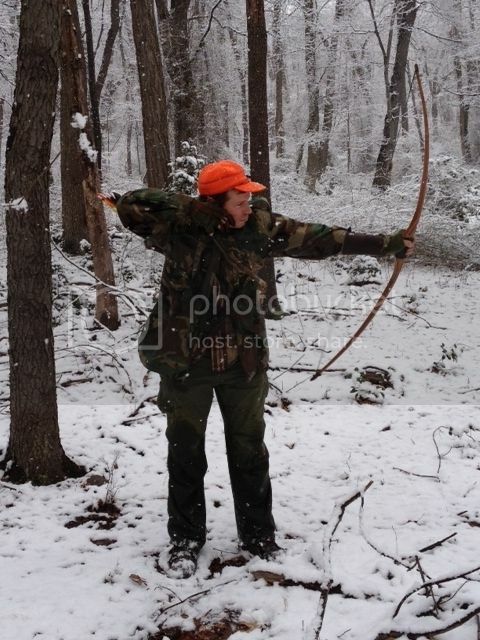 Brent was the first one to loose a flu flu from his 50’s era all fiberglass static “Action Bow” recurve, and Mike and I watched as the shaft arched up through the snowflakes and impacted a few inches from the squirrel who scampered over to my side and a few feet higher. I quickly remembered to bend at the waste way over to keep my alignment, and launched a second flu impacting just a few inches under the squirrel which again went higher. My second flu was quickly on its way and missed a few inches to the left of the animal as it sailed over Mike and several 50 yards downrange. (I later easily found the brightly colored modified cedar shaft with .357 brass head). Now one of the squirrels was on Mike’s side and he had no flu flus. Brent threw him a shaft and he soon launched it up at the squirrel barely missing it as well. What a blast!! The action was hot and heavy! By now the two were very high up in the canopy with nowhere left to go and really out of range of the bow. Brent was lamenting he left the shotgun in his truck as he could easily now finish the job and have a couple squirrels. I also remembered the several spiral flu flus I had back at the house, so we quickly left Mike to watch the trees as Brent and I went back to my house. We arrived back at the farm again and Brent agreed to be our shotgun backup. We lamented the old single barrel Stevens did not have a sling so he could continue to hunt with the bow until the time for “finishing”. I doled out a half dozen Flus for Mike and I each. By this time, the 2 squirrels were gone and we started beating the brush and looking for rabbit activity. The woods were surreal. Beautiful frosting covered all the branches and brambles as the snow kept gently falling around us. A thick fog rolled in as the temps started to warm a bit making spooky, yet peaceful, atmosphere. We cut the tracks of a few coyotes. One in particular was found along the same path of the only set of rabbit tracks we found. We flushed out a group of 3 woodcock but had to let them go as the season had been closed since the end of January for them. Good to see though! As it turned out, that initial encounter with the squirrels was the only “action” we had, but roamed many miles, got our exercise, took in awesome views and the wonderment of a snowfall hunt, and shot scores and scores of dead stumps. What a great hunt!